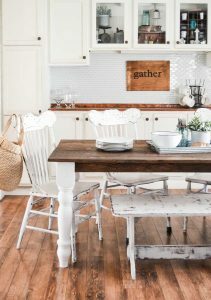 DIY Wood Sign Made From A Repurposed Antique Ironing Board. Are you lucky? When people ask that question, I often think about all the things that make me “lucky”. The important things. The things that really matter. When I heard about this St. Patrick’s Day hop, I really wasn’t sure what I would do for it. I don’t decorate for St. Patrick’s Day and I didn’t have a project idea planned for the holiday. Even though I don’t decorate for it, St. Patrick’s Day has always been fun around our house. The kids look forward to the tricks the leprechauns will play on us and we have made many traps for those little guys throughout the years. With nothing really inspiring me, I left it alone until a great idea came to me. Then, Matt came home with this little number and I knew I was making a wood sign for this blog hop. 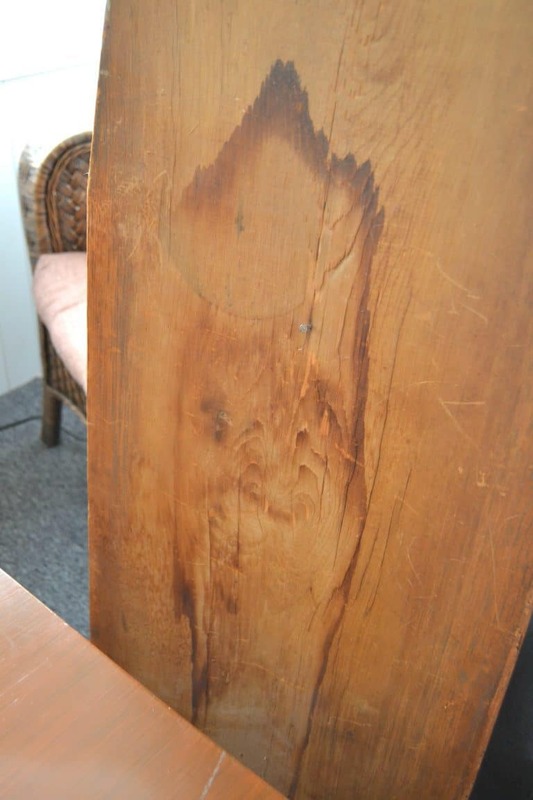 I love old, wood ironing boards and this one was no different. It was a lot bigger than any I have seen which made it the perfect candidate for a wood sign. I have had a saying in my head for a while and didn’t know how I was going to showcase it. It is all about being “lucky” which made it exactly what this St. Patrick’s Day hop needed. This project could not be any easier. Signs like these are time-consuming, but they aren’t hard. The first thing I did was take the legs off this ironing board. Then, I painted it white. Next, I used my Cricut machine to cut out the letters for the words. How great is this saying?! 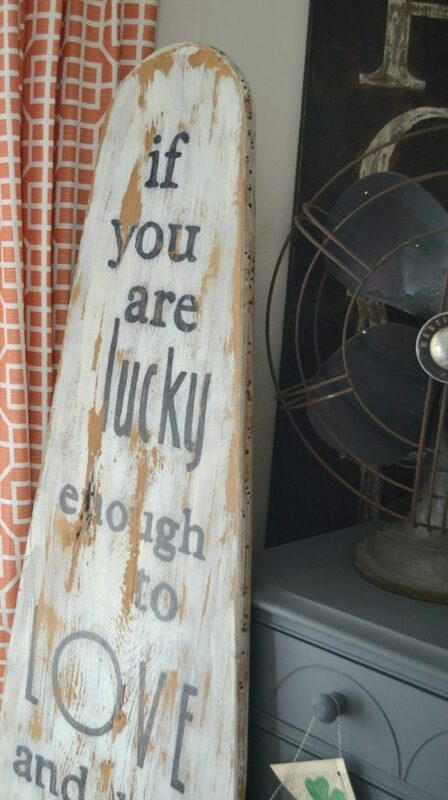 “If you are lucky enough to love and be loved, you are lucky enough”. I made a shamrock banner from old book pages that was a fun addition to this gray dresser. It doesn’t take a lot to add a little bit of each holiday to your decor. So, even though this isn’t screaming “St. 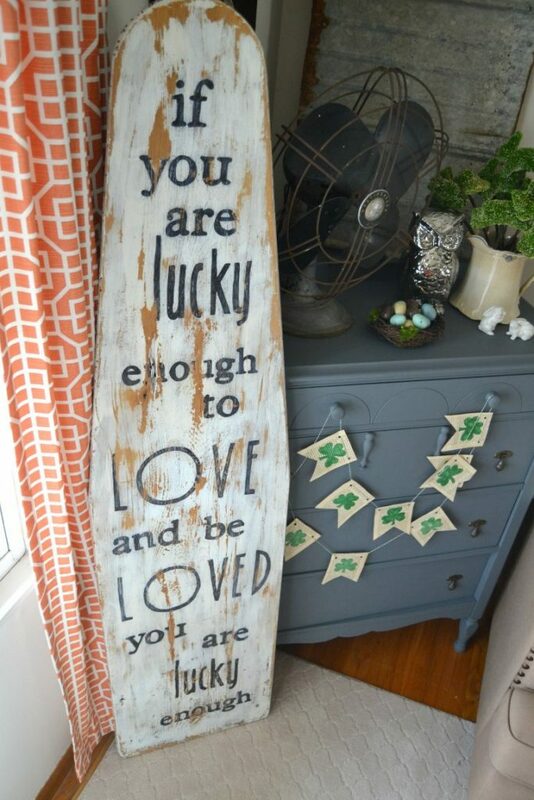 Patrick’s Day”, this DIY Wood Sign works because of the message. I think I am going to hang this sign in our bedroom. I have some things I still want to do in there and I am hoping to find the perfect spot to hang this gem. 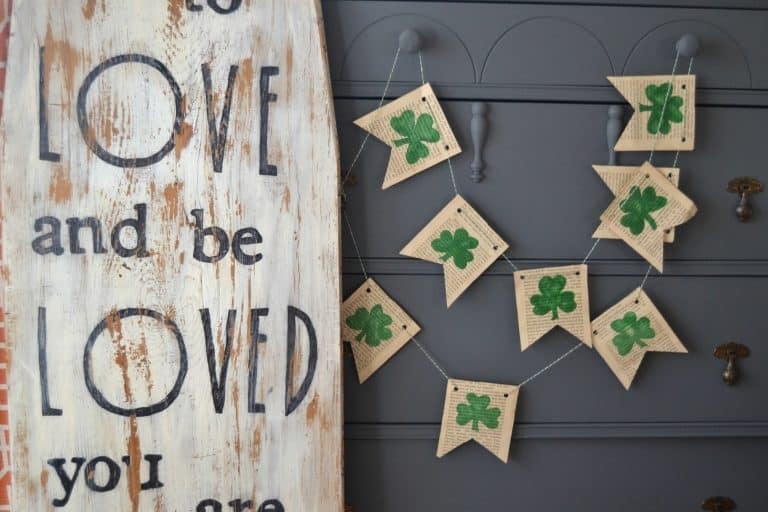 Do you decorate for St. Patrick’s Day? 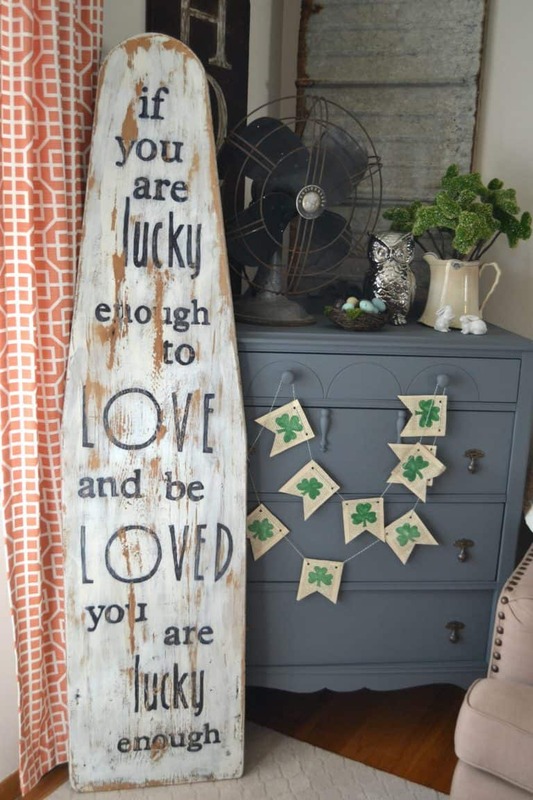 Lindsay…LOVE your painted ironing board and quote! So creative and it looks great. 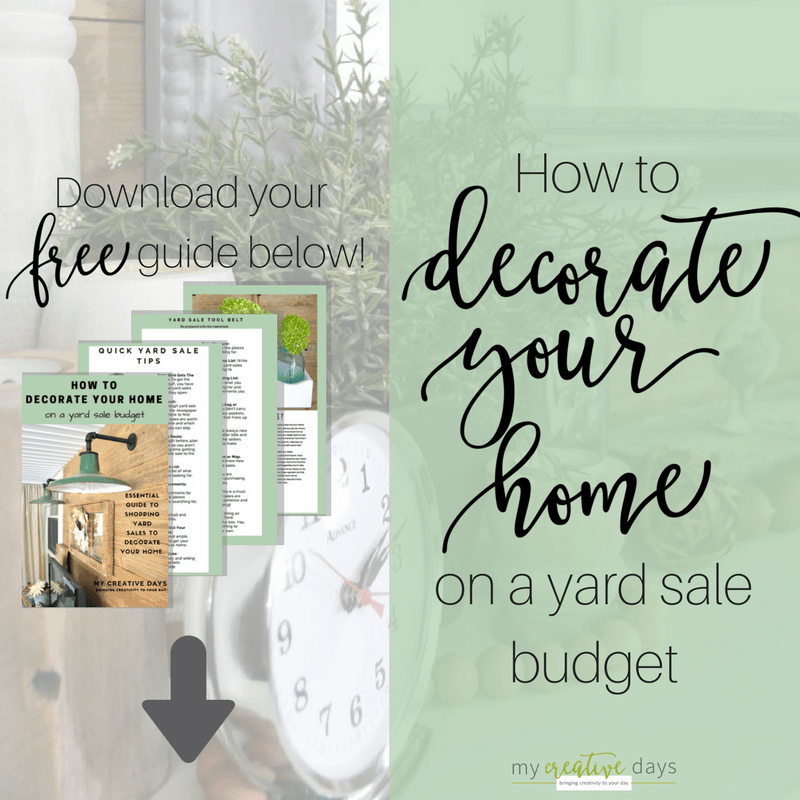 we are also glad to know that we aren’t the only ones with a stock pile of furniture and projects!! Great touring with you this week. Cheers to a wonderful weekend! Thanks! My husband is the total opposite. He is always looking for projects I can do. I am lucky that way. 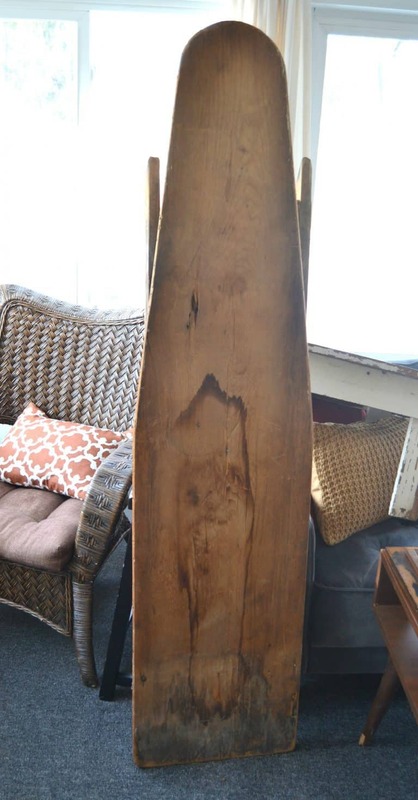 I love old ironing boards! So many possibilities! I love that saying, it looks great on the vintage ironing board! And the book page banner is awesome! I love this! The quote is perfect. And I love that the shamrock banner is from old book pages. 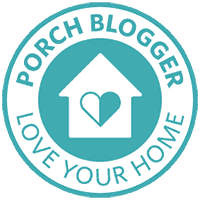 You crack me up telling people not to judge all the furniture on your porch – judge? I’m jealous of it! All those projects just waiting to be done 🙂 Thanks so much for joining in this fun tour! Thanks for having me Meg! It was a lot of fun! 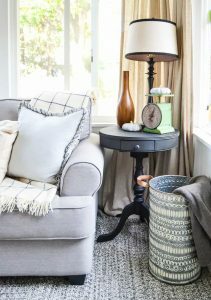 LOVE everything about this Lindsay! 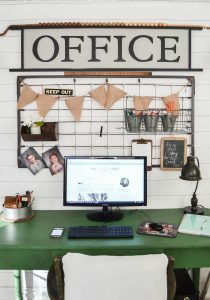 The ironing board sign is so cool and such a fun idea! 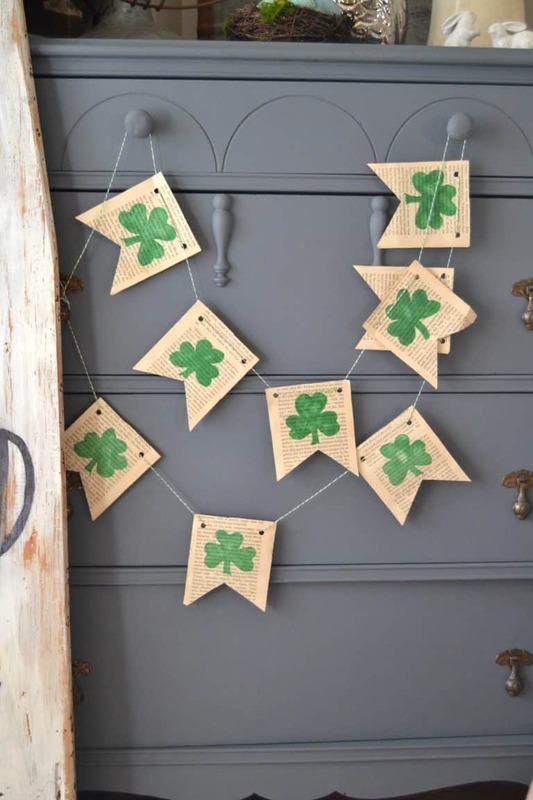 Love your little shamrock bunting too! This is awesome!!! A wonderful upcycle and art piece Lindsay. 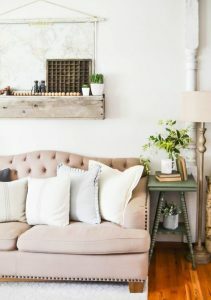 Your vignette is so darling.Pinning and sharing.